As Valentine’s Day approaches, men are going to be pressured into buying flowers, teddy bears, expensive candle lit dinners, and worst of all… the almighty diamond! Diamonds, diamonds, diamonds. Some women go crazy for them– their heads spinning, ready to fall off– just so they can flaunt and get everybody jealous. Just so they can prove that they have the power to raid their man’s bank account. Just so they can have that fat rock hanging from their finger. 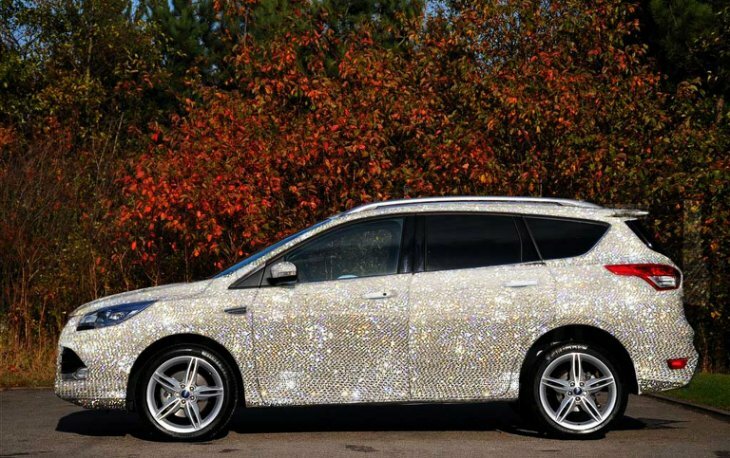 A diamond coated Ford Escape! 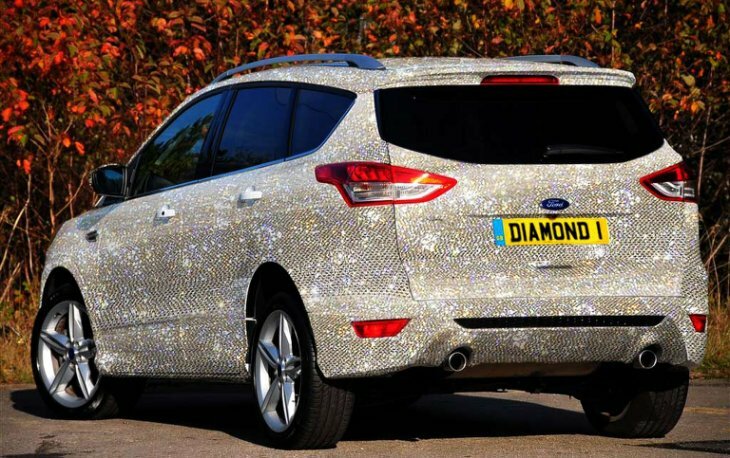 Offered as a package by Jennings Ford in northeast England, customers can have their own personal Ford Escape covered in diamonds for about $1.5 million. Jennings says they will hand-apply this special coating of diamonds and Svarvoski crystals to any personal Ford Escape. Sounds expensive, right? Don’t worry; Jennings is offering a payment plan that allows customers to plop down $152,000 to start and make payments of JUST $33,494 per month over the next 5 years. Whew, and you thought you weren’t going to be able to afford it. Okay, okay, so we all know that none of us are ever going to buy this, but this vehicle actually does serve a worthwhile purpose. The purpose?? Show this ride to your girl, and if she says that it looks cute, you know that it’s time to hit the eject button on your relationship. Otherwise, you’re going to spend the rest of your life chained to a money hungry, soul sucking bimbo. Thank you Jennings Ford!!! This entry was posted in Culture, Ford and tagged bimbo, candle lit dinners, diamond, ford escape, jennings ford, Valentine's Day approaches. Bookmark the permalink.